After another successful Open Day - Caz's Roast hits the spot! Caz's Sunday Lunches are legendary! Choice of Turkey or Pork today. Couldn't resist capturing a few moments today, quite a congregation in our bar at lunchtime. Look at what our Night Manager is up to! Nigel our very patient, capable and talented Night Manger can turn his hands to many things. Guess what he's doing now ? They Work! 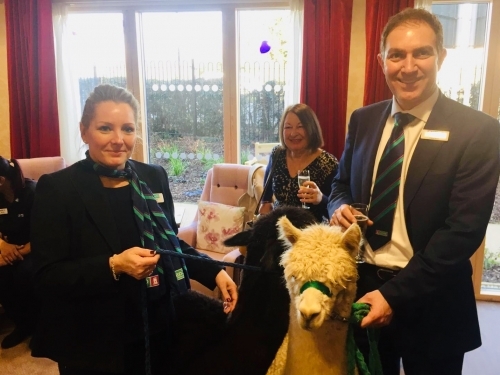 Alpaca's certainly cheered us up! Known for their shy compliant nature, I once heard that Alpaca's are meant to help relieve some symptoms of depression! How many people can you fit into our Sky Lounge ? Windsor and surrounding area U3A members joined us today! Guess how many people we managed to serve in our Sky Lounge ? 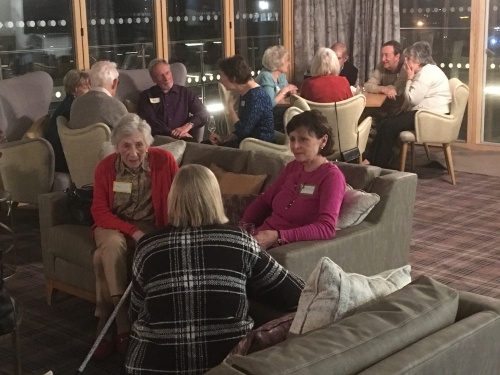 Friday night saw our residents and reserved residents, friends and family gather for welcome drinks in our Sky Lounge. Caz is at it again! 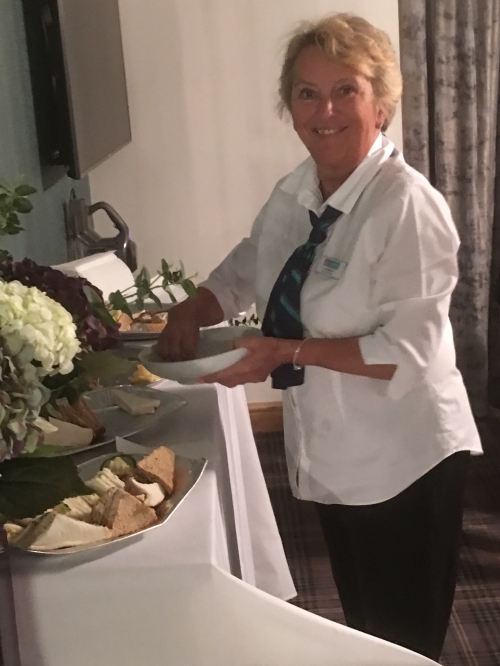 Caz, our wonderful Catering Manager (previously Squires Garden Centre), put on a lovely spread of food for our resident Welcome Drinks. 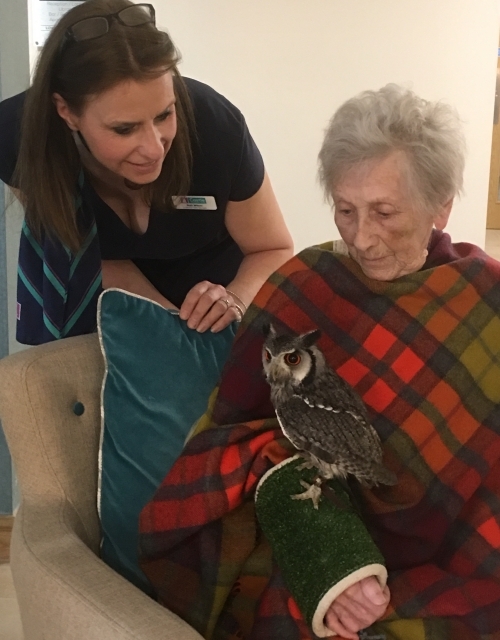 It's a hoot at Castle View! I literally came out of a meeting to find two owls, namely PJ and Ollie, signing in at reception! 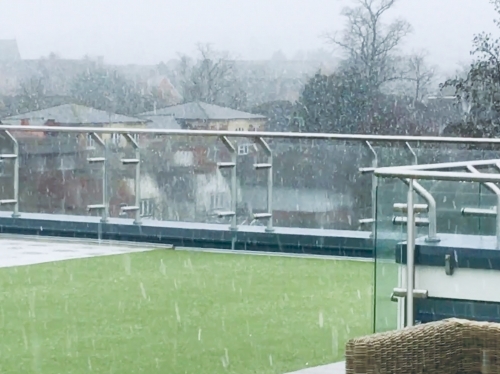 All weathers are experienced from our Sky Lounge in all their glory, as was demonstrated this afternoon as we watched, in comfort, very large puffy snowflakes fall from the sky! Today saw the third in a series of our resident and friends lunches. Robin Hughes CEO of Castle View joined in. We held our very first taster lunch today. 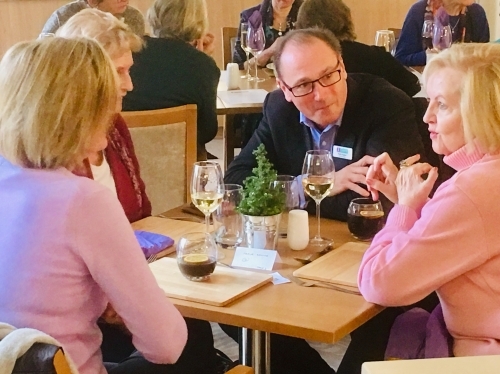 Nearly 20 residents and friends joined us in the Castle View Restaurant. 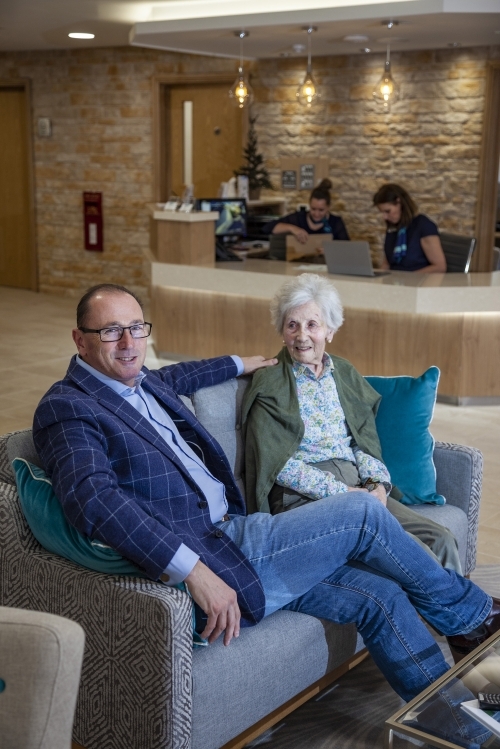 It has taken Robin Hughes 10 years to bring Castle View to completion and it is a very proud moment for him to see his Mum enjoying the facilities that 10 years ago he only dreamed of offering. This photo was taken from our Sky Lounge on one of those beautiful cool crisp days in December! Imagine what it's like in the height of summer! 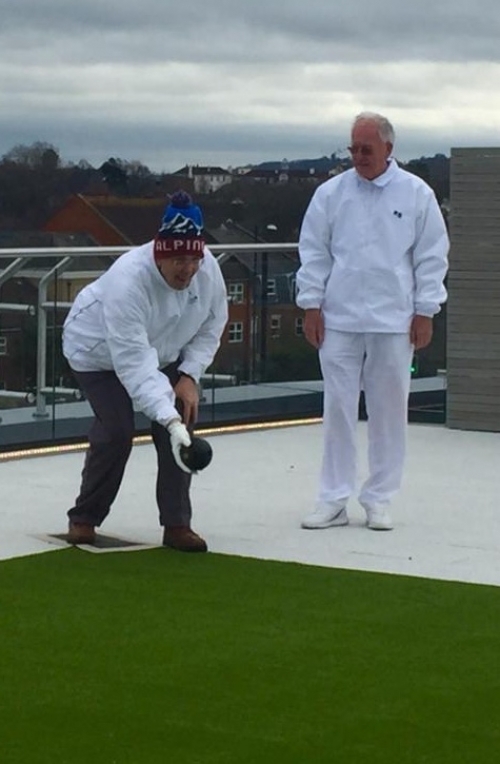 Windsor & Eton Bowling Club visited Castle View to check out our bowling green on the rooftop and by all accounts gave it the thumbs up! It's Christmas Time ..... Mistletoe and Wine.....Residents singing in Christian rhyme. Well a fantastic night was held last night in the Castle View Sky Lounge. 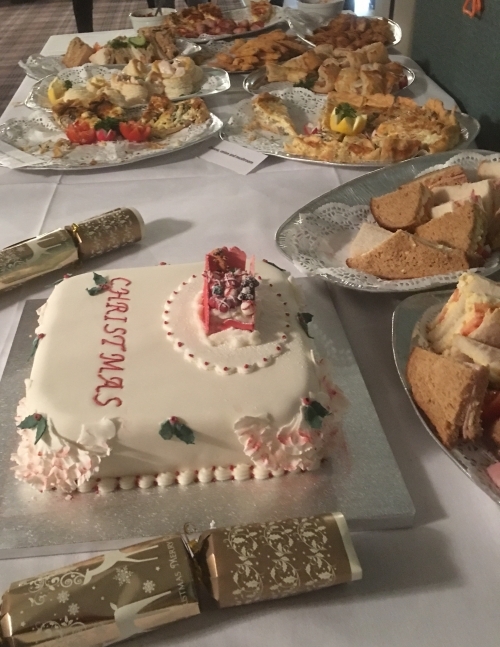 Caz Hughes, Castle Views Catering Manager, started to flex her fingers last night creating a fantastic buffet and beautiful Christmas cake for all our residents to enjoy at our Christmas Party! 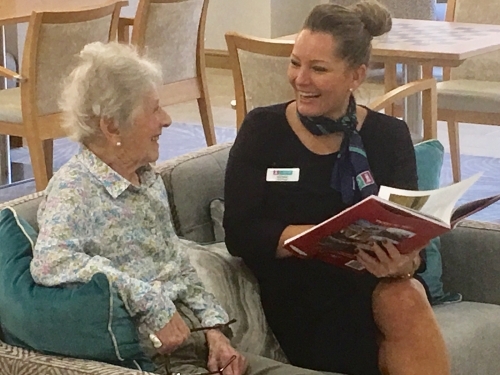 Lisa Fisher, our Village Manger, sharing good times with Betty Hughes our first resident and also mother of our CEO Robin Hughes. 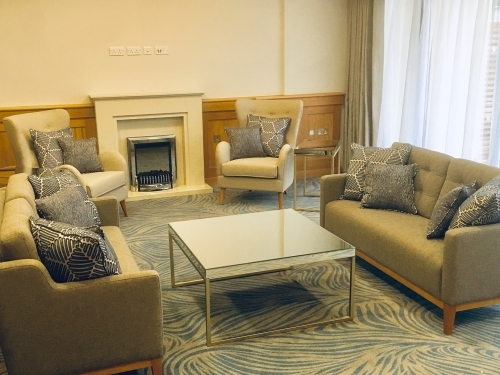 From the communal Sky Lounge to Reception, Castle View is now fully furnished. For peace and quiet but still being involved in the general throng of Castle View, the library is the place for you. For celebratory gatherings, the private dining room can be booked for seated meals or larger buffets. 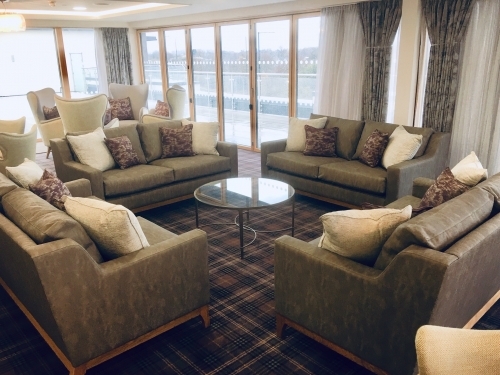 The final furniture has been delivered to the Sky Lounge. You can either sit at a table or relax on the sofas. 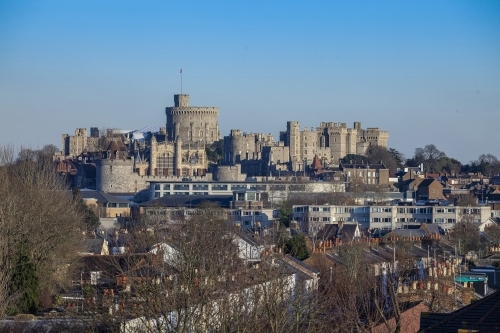 If the weather is nice, relax on the terrace under a sunshade taking in the view of Windsor Castle. The choice will be yours. Another 100 people attended our Open Day Again and the Weather Proved Just as Entertaining! Another fantastic Open Day at Castle View on Saturday with over 100 people coming to see what we are about! 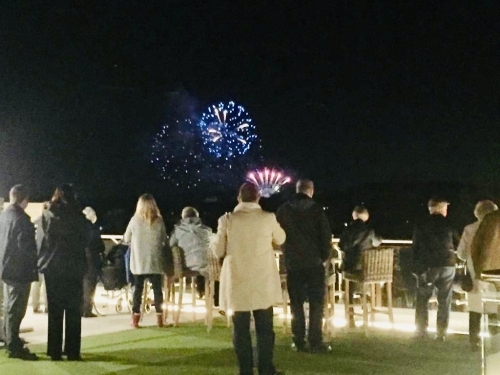 The management team welcomed reserved residents to their first social function at Castle View by watching the fireworks from the Sky Lounge. I'm sure you've heard of rooftop swimming pools but have you ever tried rooftop bowling ? 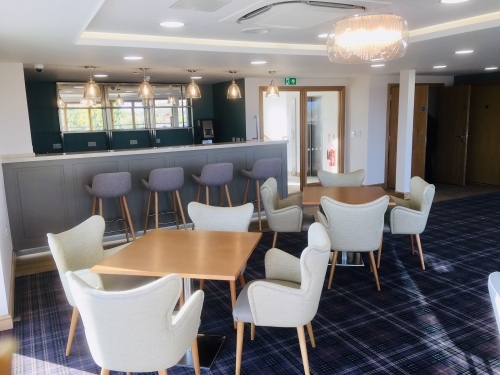 Looking spookily (note the Halloween reference) like the CGI's we have been working for so long the Sky Lounge furniture has arrived and is looking amazing. As the sun starts to light up the day, so to do the first pictures of a completed Castle View on Project Completion Day!!!! On the eve of project completion, even the grass is laid! 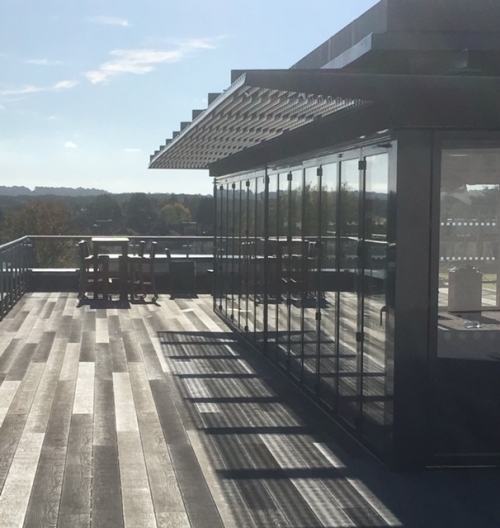 Complete with a subtle tartan carpet (if there is such as thing) the Sky Lounge was just sparking in the super Autumnal October sunshine today. 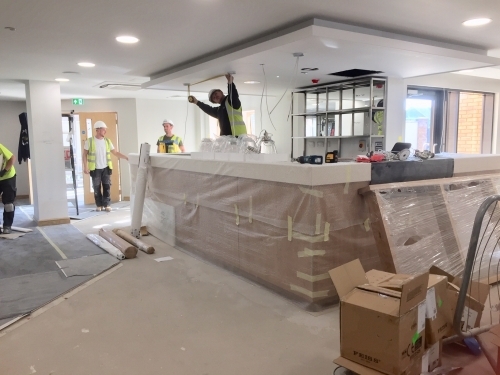 Only two weeks until project completion and the bar is going in. Final Contractors Lunch to Say Thank You So Much! 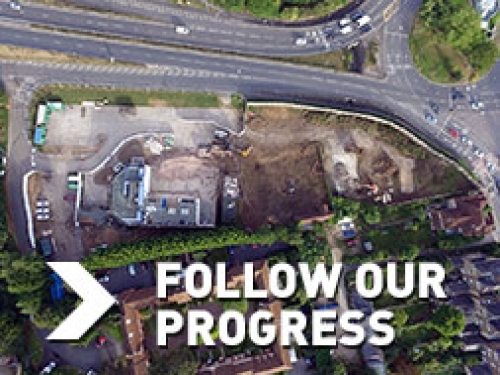 There are nearly 100 contractors currently working on site beavering away to bring Castle View to completion on time. A key aspect to keeping Castle View current and in touch is making sure our IT offerings are first class. 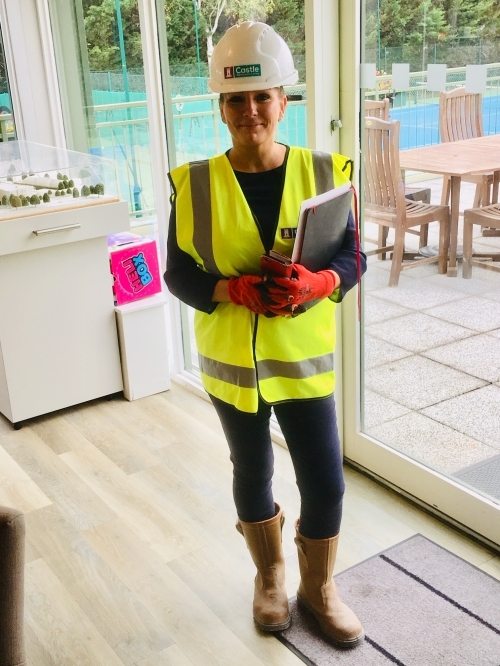 To ensure that Castle View is delivered on time and that every issue is ticked off and catered for, Lisa and the management team do regular site checks. We were busy taking visitors to site all day long this Saturday. Agents from Horlers and Savills joined us on Saturday to help with our regular tours all day. It's fun and busy and tours ran till 6pm. 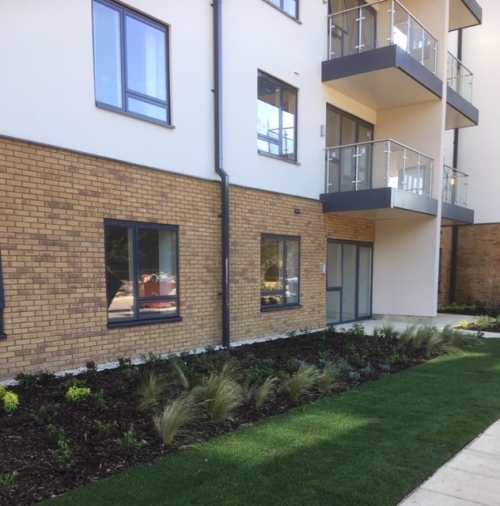 As Castle View nears completion, the gardens are being landscaped and ground floor patios laid. 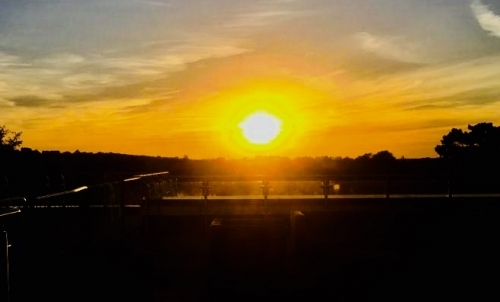 We experienced the most glorious Autumn weather on our Open Day this Saturday and as our tours ended around 6pm, it lent for the unusual opportunity to watch the sun set on Castle View as the nights are drawing in. 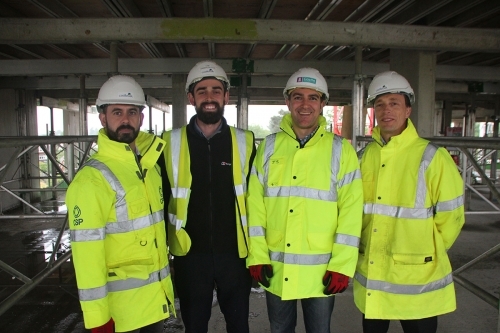 Saturday saw new and reserved residents visiting our site to see our progress for themselves. A couple of them stopped to try their balcony out for size. Simply stunning views of Windsor Tennis Club. The banners are up! We are weeks away from opening. 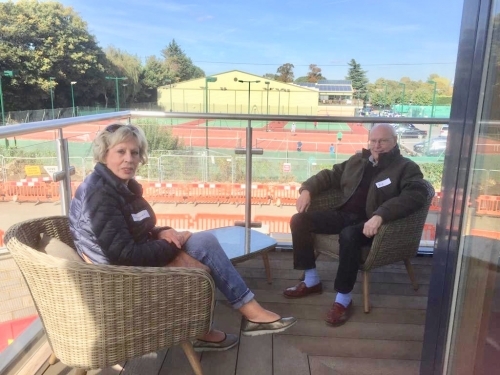 Come and join us between 10am-6pm - simply report to Windsor Tennis Club at your convenience. 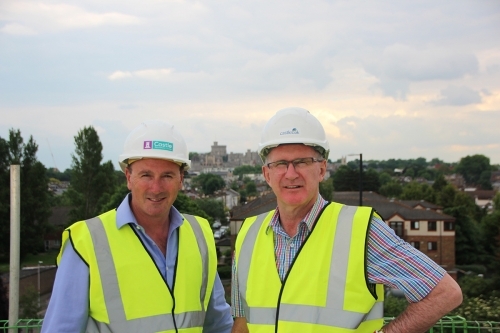 Management Team on the Roof - only a few weeks to opening! 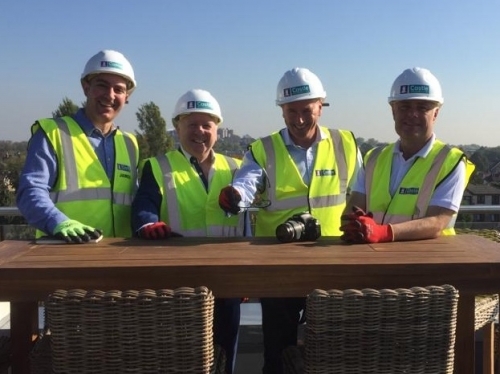 As the build enters its final weeks the management teams of Castle Oak and Castle Retirement Living take in the view on a glorious September afternoon today. 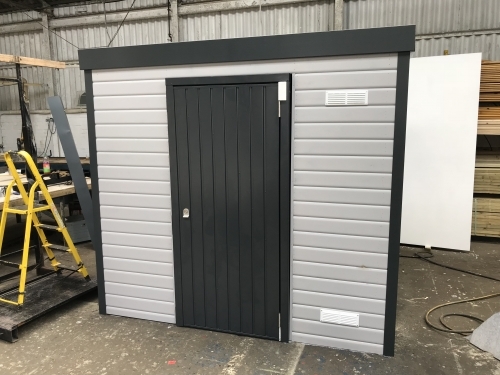 Here at Castle View we know that when downsizing adequate storage is a priority. 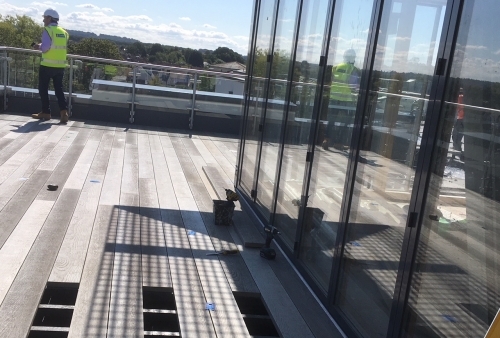 As fast as the communal areas on the Ground Floor are being fitted out, the same goes for the rooftop. On Thursday prospective residents got to see the first of the wooden panelling going up in the library. 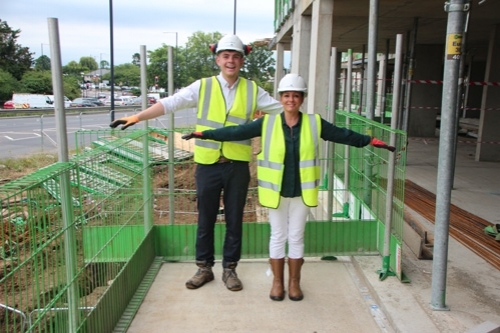 Reserved residents measure up in preparation for moving in. For the First Time Castle View Is Revealed - The Scaffolding is Down! After 10 years in the planning and nearly 2 years in construction, finally the scaffolding is down! What a scorcher! Nearly 300 Windsor residents and friends joined us for Castle View's first Open Day. 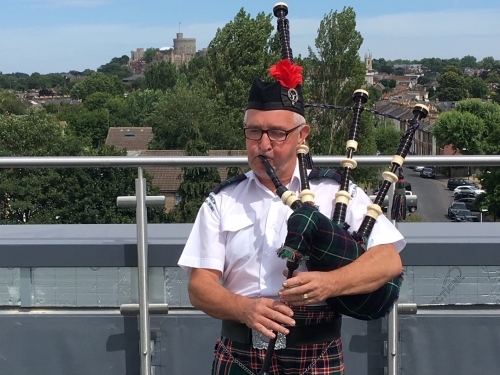 With our view of Windsor Castle in the background, Alistair, kept all our visitors entertained during our open day this weekend. Residents Trying Out Their New Apartments! The show apartments are ready! 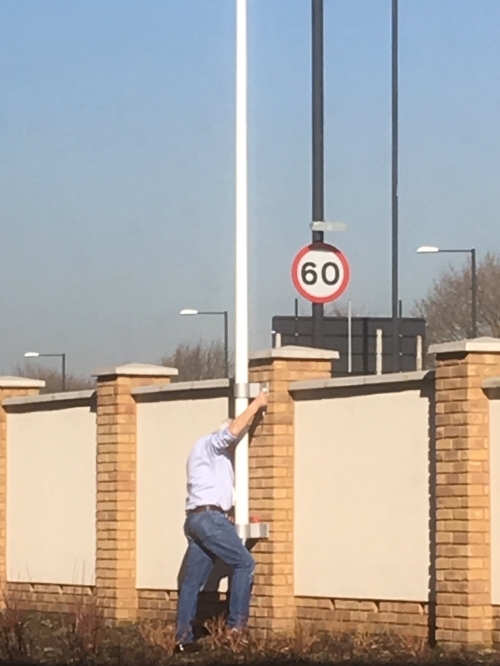 Residents are trying them out for size! 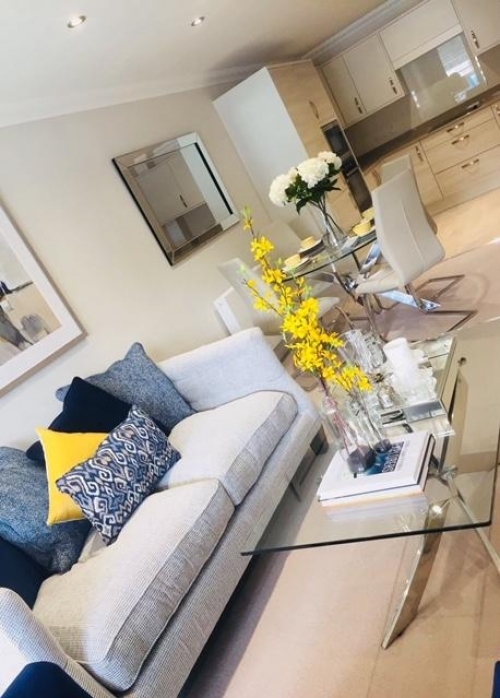 For the first time Castle View has four beautifully and thoughtfully designed show apartments available for you to see on our Open Day. Castle Retirement Living treated all the workers at Castle View to a contractor lunch of chicken curry and rice. Children of Clewer Green Primary School should be very proud to see their artwork displayed on the Castle View hoardings. 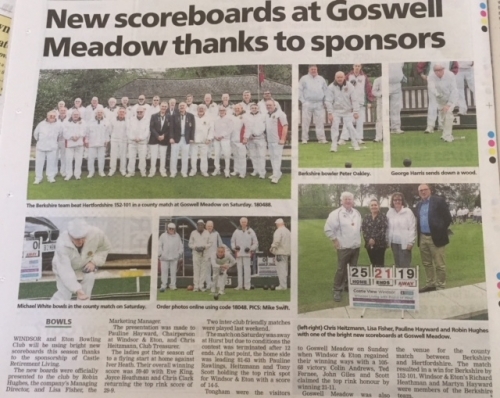 The new boards were officially presented to the club by Robin Hughes CEO of Castle Retirement Living and Lisa Fisher our Marketing Manager. Many congratulations to Rayyan Sulaiman from Clewer Green Primary School who won our Castle View art competition. Horlers and Savills joined us for a marketing and sales update. Been driving past for years and wondered what it was like inside ? Thinking of downsizing ? Looking to make some new friends and to join a caring community ? The Test Apartment is ready! Come and Take A Look! And its looking amazing! Check below for the Kitchen. It really does look exactlly like the pictures we have been working with for so long! Castle View takes care of the detail. A separate tumble dryer and washing machine are provided in the utility cupboard. For those apartments that have fireplaces - this adds a warm and inviting finishing touch. 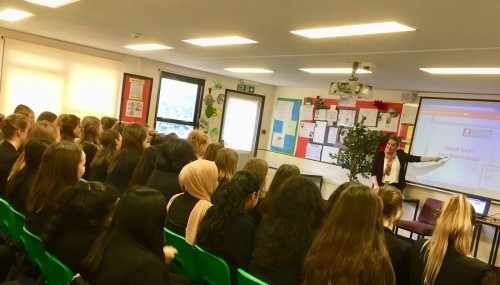 This week Lisa visited Windsor Girls School to launch Castle View's photographic competition to the girls of Year 12. 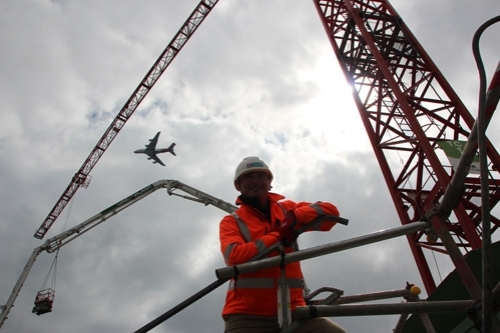 Fancy a bit of Plane Spotting ? 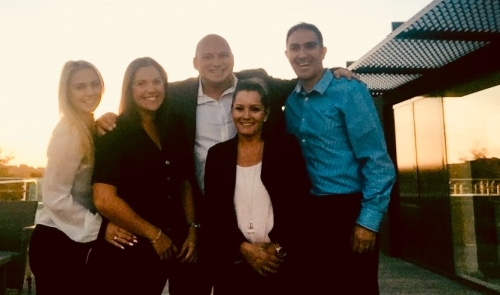 Castle View Sales Team Pipped at the Post! Did you see us ? We braved the weather to race our pancakes! We had to toss them 3 times to qualify while running. It's not just the Sales Team that get out and about spreading the word about Castle View. Castle View will have a fabulous restaurant, lounge and bar on the ground floor as you enter the reception area. The Scaffolding Has Started To Come Down! The first glimpses of the development without scaffolding are apparent. We are committed to getting out and meeting the local Windsor Community. We enjoy answering questions about Castle View and listening to any feedback. If you see us, come and say hello and find out more. We will be in Windsor Waitrose on Wednesday 7th February and Daniels Department Store on Friday 9th February 2018. You won't miss us we will be in one of the entrance ways with pop up banners and architects model of Castle View. 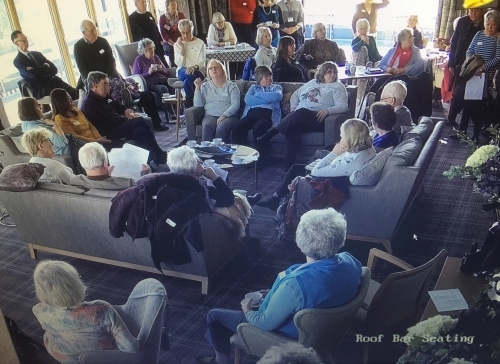 Potential residents enjoyed a site visit and the rooftop views at Castle View. Don't look up the crane is passing overhead! There's a buzz happening around Castle View. So many interested people came in January, we were worried about losing them on our site tour!. If you've been before and want to see how Castle View is progressing, book in to our next coffee morning. 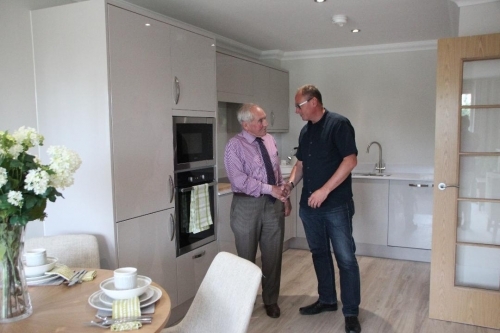 Castle View is all about the local community, as well as driving the highest of standards. One way to combine the two is to work with Windsor Boys School on a research project. We asked the boys to design questionnaires to research menu and social activity choices for Castle View. So a group of boys from the 6th form at Windsor Boys School visited our marketing suite to present their ideas. Once finalised, they will be out in full force in the town centre asking senior locals their preferences. 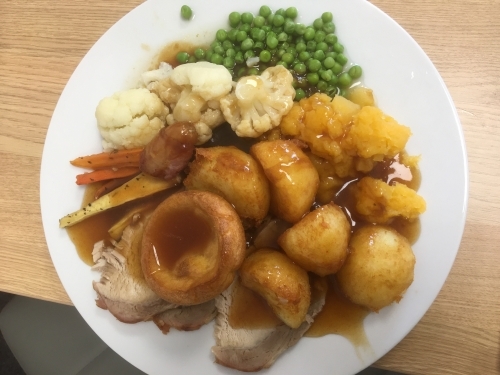 The results of their surveys will help us to create menus that we hope our residents will enjoy and as well as organising popular activities. 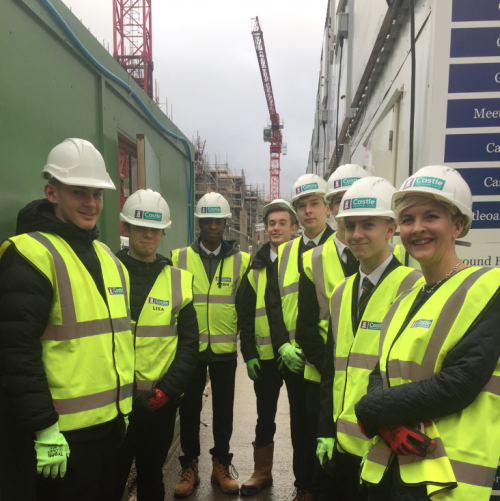 Lisa took the boys on site to show them the build so far, particularly the Restaurant, Bar and up to the Sky Lounge! Look out for them on 9th February in town and say hello! 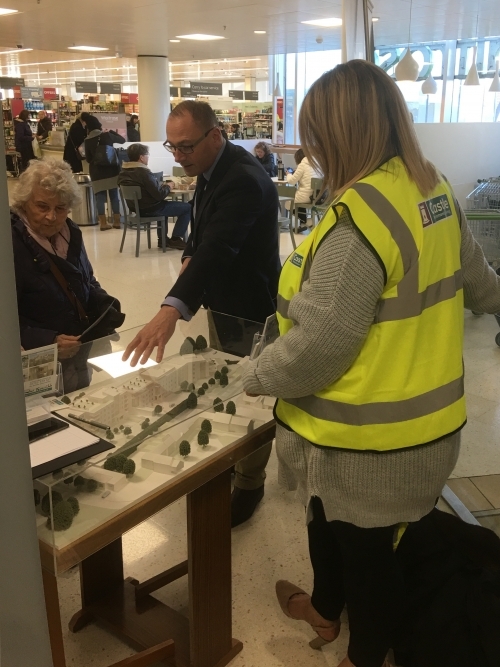 We've been getting out and about sharing the progress at Castle View with shoppers in Daniels department store. We're hoping to make it a second home and be there quite regularly. Our next visit will be Friday 9th February. 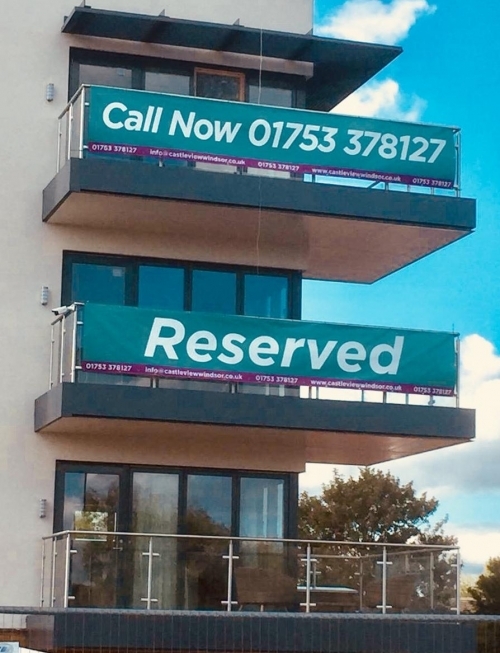 We'll be there all day, so if you fancy a chat or always wondered how much it would cost to buy an apartment at Castle View ?, or want to know when the cranes are due to come down ?, any questions at all, come and say hello. We're right by the cafe so you can have a cup of coffee while you're doing it! We love being at Tescos, because it's so close to the building site. 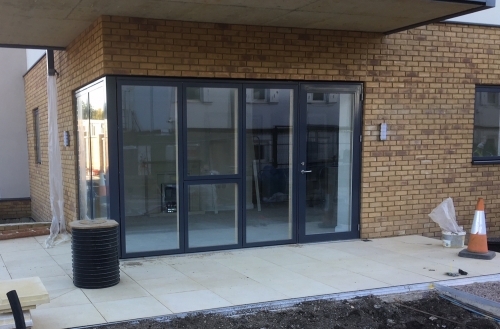 We get all the feedback about the building works and everyones expectations of Castle View. If you see us, don't be shy, come and say hello. We chatted to a lot of old friends and made some new ones, like our new post man! We're always happy to have a chat and spread the word! New year, fresh start ? 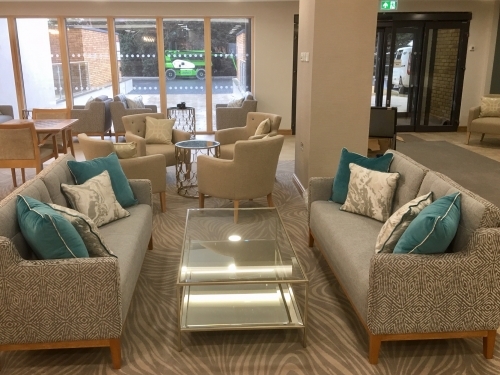 Come and take a look at Castle View, for a modern approach to retirement living. We meet at Windsor Tennis Club, right next door to the site. Anyone who is interested in Castle View is welcome, click link for more details. The Kitchens are going in! Sky Lounge windows are complete! It seems to have happened in the blink of an eye, but already the Sky Lounge windows are in. 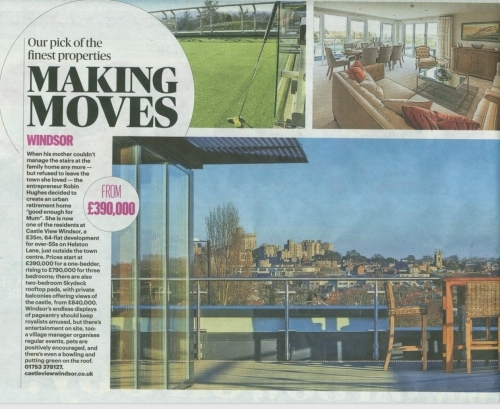 It's an amazing space, offering views of Windsor Castle rarely seen in Windsor and beautiful views of Legoland hill. 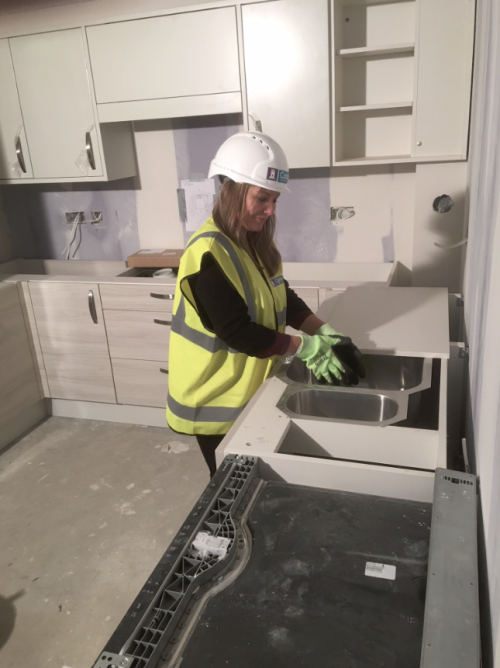 More photos to follow as the internal fitting out of kitchens and bathrooms continues to accelerate. 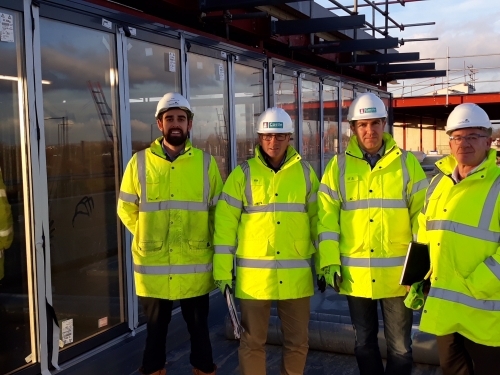 It has been a monumental 12 months from all the team involved with Castle View, which opens in less than 11 months time. On 16th December, we staged a full fire rescue exercise on site with Berkshire Fire and Rescue, which confirmed that every aspect of the building is accessible by the brigade platform ladder so our approach to fire safety is best in class. Celebrating Christmas with the Castle View Contractors Lunch! Christmas lunch for the 140 strong Castle View Team on site. The crane took up hot chilli, rice and mince pies in a skip and lifted the whole lot to the 3rd floor. Served hot, to tableclothed tables and Chistmas crackers. No mean feat for a site that has no power! Carlie from Horlers pitched in helping to prepare, serve and clear away. Thank you Carlie! The bathrooms are starting to go in! The picture is a little dark as obviously there is no lighting as yet. Progress is rapid on the rooftop and now we are able to stand where the Sky Lounge bar will be. Lisa, Ruth and a potential resident practising pulling pints in anticipation! 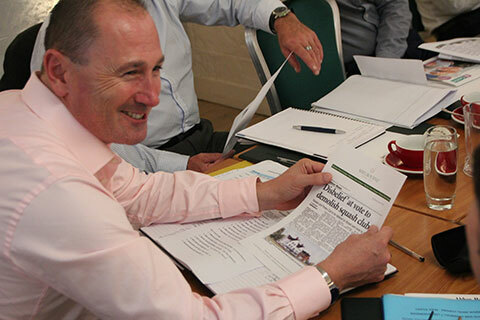 October saw the whole Castle View project team get together for their annual review. Including architects, health and saftey, construction, a representative from every aspect of building Castle View. Relationships were strengthened, key issues sorted and planning agreed. 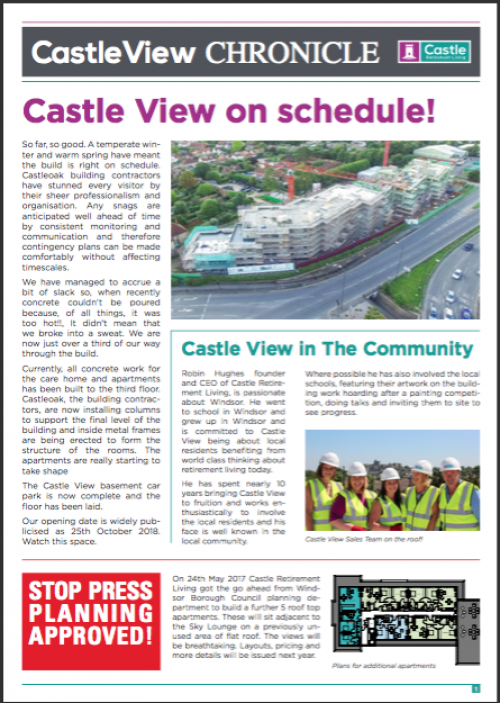 Next October, Castle View will be up and running! 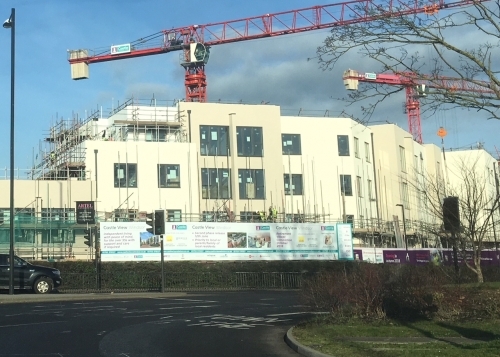 If you've been driving past Castle View for the last few years and ever wondered how it's taking shape inside, well here's a quick view of progress. One of the many unique aspects of Castle View as a retirment living proposition is it's namesake, the view of the Castle. 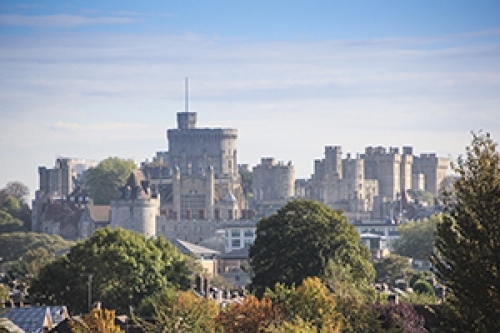 Castle View is all about Windsor residents and the local community. So we never waste an opportunity to get out and get as involved as we can. Recently we took the opportunity to visit Daniels department store during their special Christmas shopping evening. Spreading the word in Tescos! 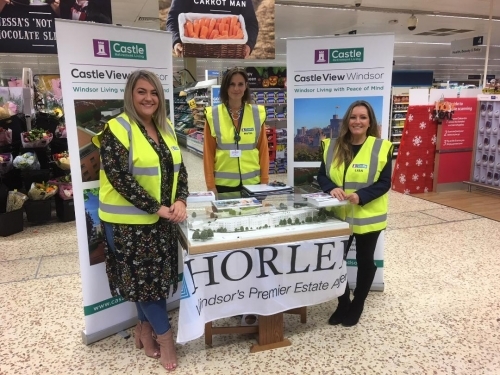 This Saturday Horlers and Castle Retirement Living took Castle View to the residents of Windsor and spent Saturday in Tescos!. CEO Robin Hughes is watching as the first concrete steps are assembled for Castle View. Won't be too long now that the scaffolding stairs are a thing of the past. The internal construction is really taking shape with apartment layouts and partitions starting to be assembled. 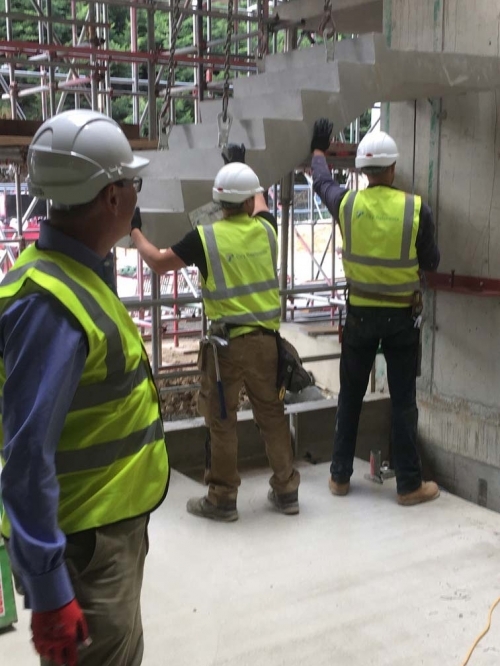 All the concreting has been completed, which is great for achieving construction targets and a major milestone achieved in the over all build. To celebrate Castle View provided fish and chips for lunch on the rooftop! 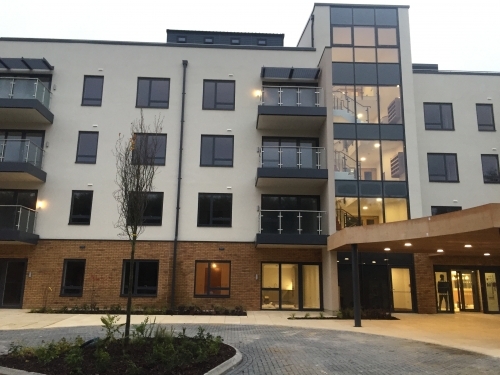 Castle Retirement Living is putting safety first at its flagship development – Castle View Windsor – by investing in a fire strategy which exceeds all legal requirements. 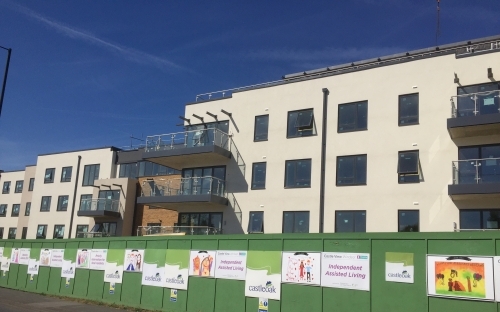 The move follows the recent fining of a retirement home operator for failing health and safety measures after a fatal fire and the tragic Grenfell Tower fire. 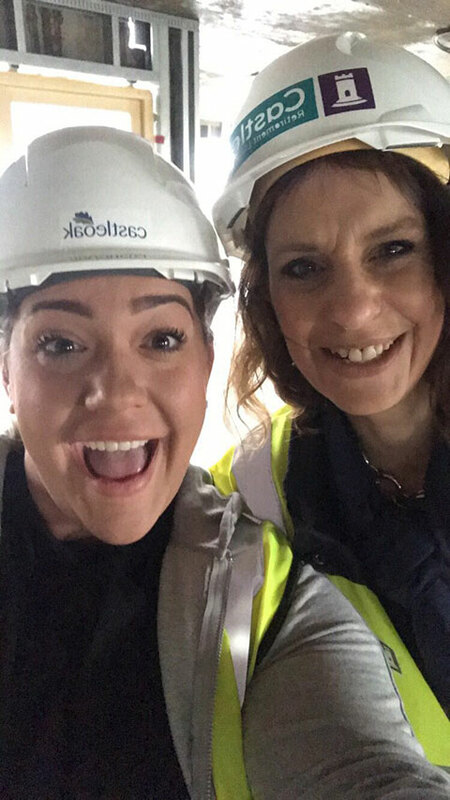 Horler's agents checking out progress on the roof! It is not quite possible to appreciate the view from the Sky Lounge until you have experienced it. Local family run estate agents Horler's came on site, so that they can fully appreicate it's impact. 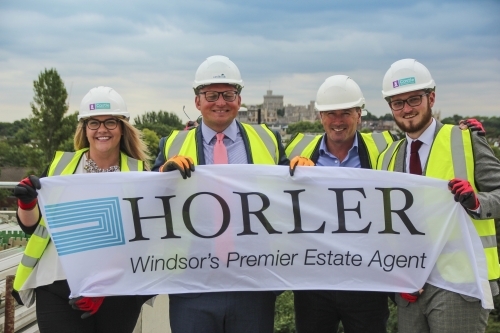 Sales Team, Castle View, Horler's and Savills taking in the view from the top! 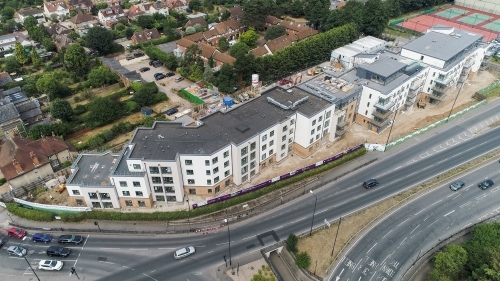 We are carrying out regular aerial photography as the Castle View Windsor development progresses, so that you can keep in touch with the project. 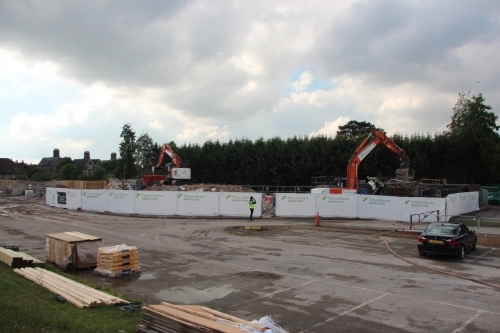 The demolition programme and clearing of the Castle View Windsor site have now been completed. This allows the construction project to commence. 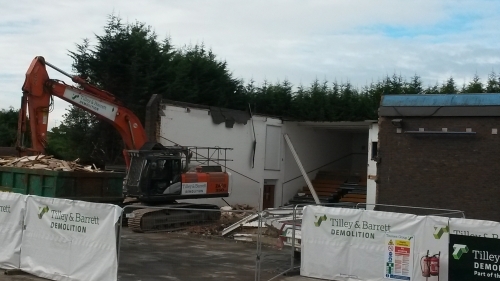 Only four weeks after work started, the Windsor Squash Club has been demolished. 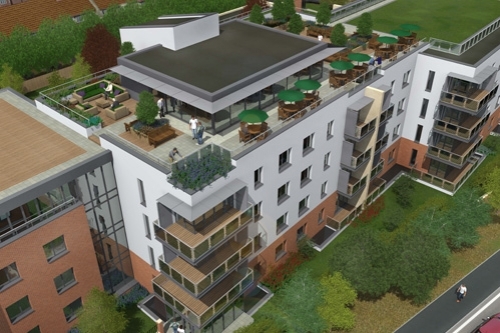 Demolition work has started on the site at Helston Lane, Windsor, Berkshire, to prepare for the construction of the Castle View Windsor Retirement Village. 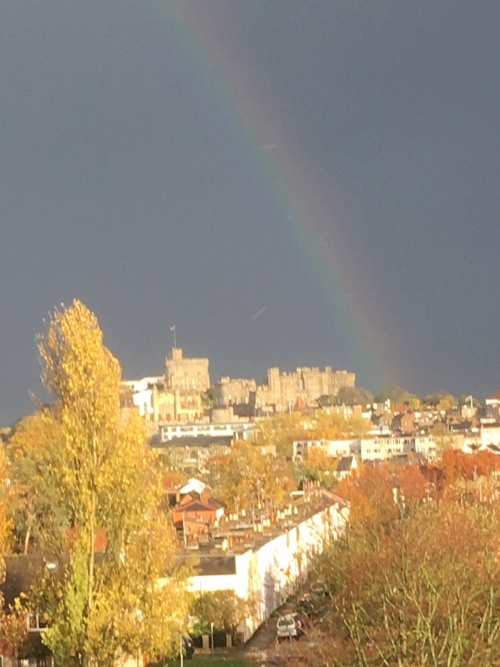 The Castle View Windsor development will be completed by 25th October 2018. 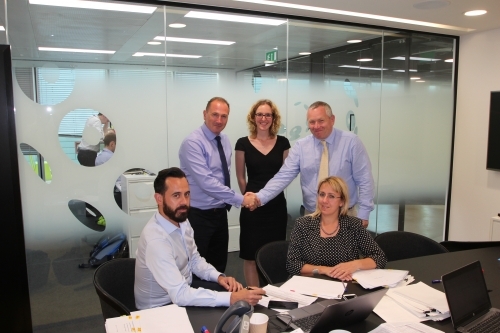 All aspects of the building contract have been finalised and the contract with Castleoak was signed on 25th July 2016. The Windsor Club, on the Castle View Windsor site at Helston Lane, closed on 30th June 2016. The site will shortly be hoarded to make it secure, so that preparation work for the demolition of the existing buildings can commence. 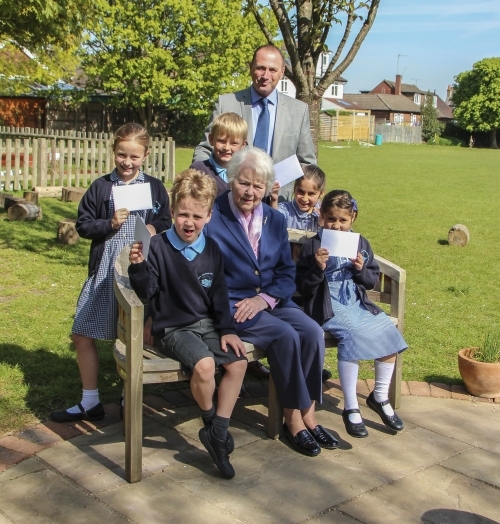 Castle Retirement Living, developer of the Castle View Windsor retirement village in Windsor, has celebrated the Queen’s 90th Birthday with a competition run with Clewer Green CE First School. 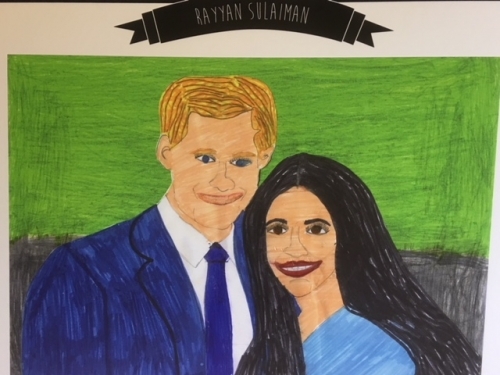 Pupils from all years created a piece of art and finalists from each age group were presented with prizes of Daniel Gift Vouchers by Mrs Daniel at the school last week. 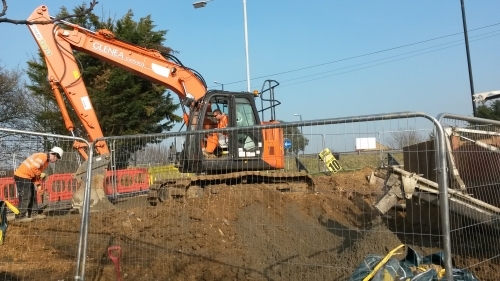 The sewer diversion under the Castle View Windsor site is progressing well, with the contractor in advance of the schedule. 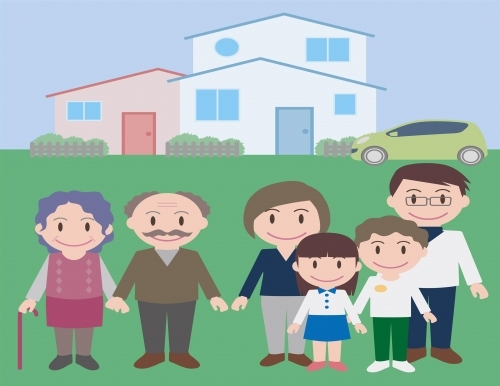 Britain’s population of over-65s is expected to grow four times faster than the general population over the next five years, resulting in greater demand for retirement housing. 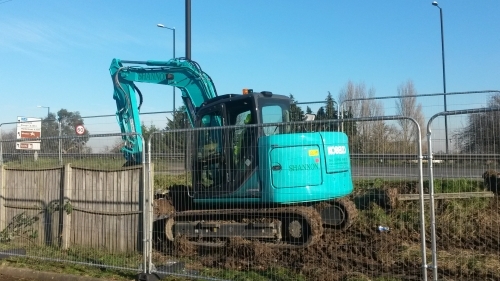 The work to divert the sewer that runs beneath the Castle View Windsor site has commenced. Once complete, building on the site will start. 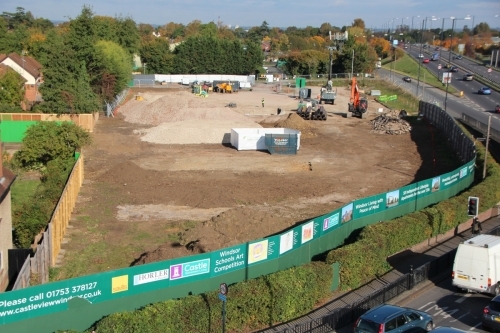 The British Red Cross and Mencap buildings on the Castle View Windsor site have been demolished, as the first stage of the building programme, and hoardings have been put up adjacent to the Clarence Road roundabout. 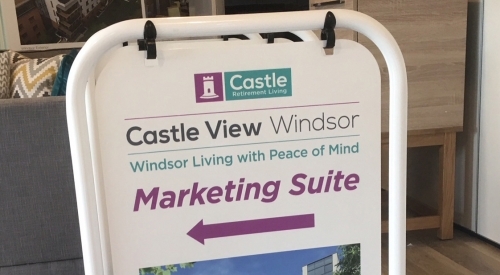 A launch weekend for the new Castle View retirement village was held recently, giving prospective purchasers an insight into the development, and the opportunity to experience the superb views of Windsor that will be available once completed.